Use our system to sell memberships to your pool or club. You will use our event registrations to create a registration for each membership type. This is the process. Create event for one of the membership types. Create registration tied to that event. Repeat for each membership type. Create landing page with links to each membership. Chameleon users: Go to your Calendar page in the top menu. If you do not see the New Calendar Item button in the upper right (as shown below), you will need to activate the new calendar. New CMS users: In the side menu click Events & Competition > Team Events. Click New Calendar Item > Team Events. Title — Something like "Family Membership Registration." Keep it limited to a specific type, rather than a generic type that covers multiple types. Start/End Date — Date range for which the membership is valid. Under TEAM EVENT SIGNUP / REGISTER, select Allow Online Registration; Connect to eReg System. Fill in the TEAM EVENT DESCRIPTION with enticing marketing copy. Fill in any other relevant details and click Create. It will ask, "Proceed to set up the registration for this new event?" Click YES. A new window will open. Enter the Registration Title, which is generally the same as the Event Associated title. The Short Title is what will be visible in the billing system. Set Turn on for Registration to YES, assuming you're ready for people to see it listed, even if the registration isn't open yet. Enter the date range that the reg is Open For Returning Members. Allow returning accounts to add new members should generally be set to YES since the reg isn't for competitive events. You can even set Hide this field next to it to YES. You will generally set the date range for Open For New Members to the same as for returning, unless your open spots are very limited and you want to open up to returning members first. Set all apparel selections to Hide. To get Email Notifications to Select Admins when Registration Occurs, set it to either to either Instant Notification to receive an email everyone someone registers, or Daily Summary to receive one daily email with all regs for that day, then enter the email address to send the notifications to in the next field. Modify the Title Page, Agreements, and Success page as needed to reflect the specific member registration type. Fill in any other relevant fields and selections, then click Save Changes and then OK to confirm. Unless you have more than one location, you'll leave the first selection as NO. Payment options are generally NO as well since seasonal teams typically collect all money up front. For Registration Groups, you generally will have just one called Member or Pool Member. Unless the group already exists, click Add New. Enter the Registration Group Name, such as Pool Member. Check the box by the group you added, such as Pool Member. If you have families with past due balances, set Connect Outstanding Balance to YES. Select the Chart of Account for the Group. You will typically leave the amount as $0. Under Per Account (Family) Charge, click Add More Per Family Charge. Fill in the details for the cost of the actual membership and click OK.
Add any other fees or options and click Save Changes and then OK to confirm. Create additional event registrations for each membership type, such as "Couples" and "Individuals." 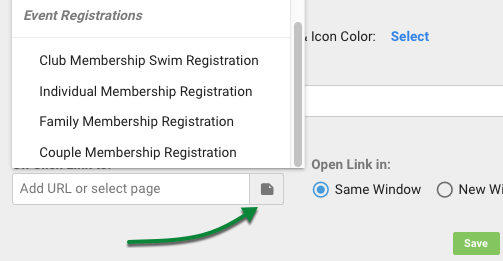 If you have just one or two membership options, you could link them to the home page command buttons. Otherwise we recommend you create a landing page with links to all the different memberships. Click Register Online by an event reg. Select the URL in the browser address bar and copy it (Ctrl+C on Windows, Command+C on Mac). Paste the URL somewhere temporary, such as Notepad. You'll need to make note of which URL belongs to which reg. Click the browser's back button to return to the Calendar. Repeat for each additional event reg. In the side menu click Team Admin > Website Design. If you want the page to be a top level tab, click Add New. If you want it to be a subtab, click the tab name you want it under, then click Add New at the bottom. Enter the Menu Label or Sub-Menu Label, such as Pool Memberships. Set Displaying Order where you want it in the tab or sub-tab list. Set Access Control to Everyone. Navigate to the newly created Membership page by clicking its name in the top navigation menu. Click Edit in the upper right. Add some marketing copy in the editor describing your memberships, pricing, etc. Add a link to each event reg. Type the name of an event reg, such as Family Membership. Highlight the name and click the Link button. Copy the appropriate URL from the place you pasted it, such as Notepad. Paste it into the URL field and click OK.
Repeat for each additional reg. Given that the New CMS lets you add different command buttons to any page, we'll go with that option to make it easier to set up. In the side menu click Website Design. Click the Site Navigation overlay. If you want the page to be a top level tab, click + Add Tab. If you want it to be a subtab, click + on the tab you want it under. Enter the Tab Label, such as Pool Memberships. Click + Add New Page. Give it the same Page Title, such as Pool Memberships. This would be a good one to set Show in Team Resources? to YES. Add some marketing copy to Page Content describing your memberships, pricing, etc. Click Save to close the Add Tab window. Click Close to exit the Menu Tabs window. Click the Layout Section overlay. Click Select component(s) to add. Check Command Buttons and click Select. Click the Command Buttons overlay you just added. Enter a name, such as Membership and click Create. Click the Choose Display Type dropdown to select the button appearance. Simple — button is a solid color with a small icon and label. Image Thumbnail — button has a larger label and can have an image that covers the entire button. Now you will add Command Buttons for each pool membership event registration based on the Display Type (skip the initial set of steps since you already have the dialog open). In step 7 of both procedures, click the page icon and select the appropriate event registration.